When you buy a laptop nowadays, it is becoming much more common for it to only have USB-C ports. While you can thank Apple for leading the way with its MacBook line of laptops, plenty of Windows PC manufacturers are following suit. This is wise, as it future-proofs your computer while giving the ability to connect to legacy devices (if needed) with low-cost dongles. Microsoft has infamously omitted USB Type-C from its Surface devices, which may cause pain to consumers in the future. 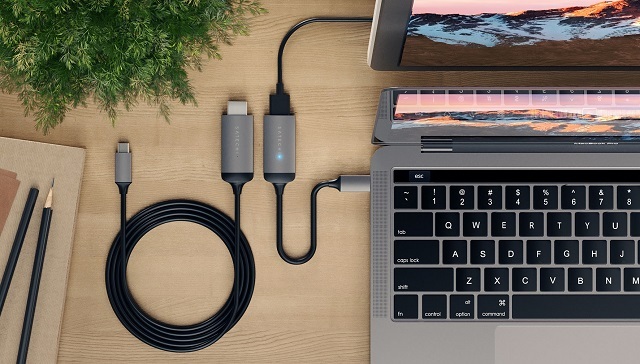 If you have already invested in one of these USB-C-only machines, there are two dongles that are definitely worth buying to keep in your bag -- USB-C to HDMI and USB-C to USB-A. Some users may need an Ethernet adapter too. Satechi has two new USB-C to HDMI options -- an adapter (dongle) and a cable. Both appear very well made and are quite affordable. Best of all, not only do the products offer 4K output, but at the much desired 60Hz. Despite being sold in color options that match Apple's laptops, the adapters will work fine with both Windows and Linux too. "The 6-foot Type-C 4K HDMI Cable and the more compact Type-C 4K HDMI Adapter output video from a Mac (or other compatible device) to an external 4K display that supports the high quality of 60Hz for a crystal clear, crisp viewing experience. The Type-C 4K HDMI Cable provides a plug and play, all-in-one solution to connect a Mac to a 4K display," says Satechi. The company further says, "The Adapter provides the same functionality in a smaller form factor to experience a crystal clear 4K display. Users can easily mirror content on their Type-C laptop to view their favorite TV shows and movies on an enhanced, high-resolution display or even in professional or classroom settings to enhance presentations on an external monitor." The Satechi Type-C 4K HDMI adapter can be had for $35 in on Amazon here, while the cable is just $5 more at $40 here. Keep in mind, while the adapter is less expensive and more compact, you still have to add your own HDMI cable. If you are moving between multiple locations that already have HDMI cables, the adapter could be a better buy. With that said, the cable variant eliminates the need to worry. It would stink to get to your location with an HDMI dongle and find no compatible cable. I'd probably suggest spending $5 more and getting the cable for peace of mind.